It’s a fact that you can’t trust everything you read. Whether on the internet, in the newspaper, a magazine, or a book, we need to question the information handed to us. As parents, our relationship with our children involves some leading, and a lot of following. We strew different topics through our children’s lives and wait to see what catches their interest, then we follow along for the ride ready with something new when, and if, their interest wanes. They might not find a certain topic particularly interesting, while a different one catches their fancy. The first topic gets tucked away for a different day, while we seek out more information on the topic they’re eager to learn about. Encyclopedia’s and other such books are great resources for strewing. So many different topics to pique someone’s interest in one place. However, it’s important for parents to have either a passing knowledge about the subject matter, or double (triple) check every resource. Otherwise we could inadvertently lead our children to false information. The page pictured above came from a book Ella got for her birthday. Can you see what’s wrong with it? There are many people who might not see what’s wrong. Their children in turn also won’t know the information’s incorrect. Is it a major cause for concern? With this specific error, no. However, some incorrect information could lead to any number of problems depending on the information. As a nurse it’s important the information I use to influence my practice is accurate and from reliable sources. Neither life nor death is on the line when it comes to children’s books, but teaching our children young to be discerning readers will help them later in life. This doesn’t mean we need to know everything in order to guide our children’s education (teachers certainly don’t) however it does mean there are certain things parents should do to ensure their children get accurate information. First read everything either before your child gets it, or with them. With young children (i.e. not reading yet) you can change the words to reflect the real information. As children get older you can point out the inaccuracy and find the real information together. It becomes a learning moment. Unfortunately there’s also the possibility that a trusted source, a source that should provide accurate information, makes a mistake. For instance the Disney Press company is usually pretty good about providing accurate, if brief, information. This book in particular also has a list of respected individuals that vetted the book prior to publication. Though none of them seem to have any particular geographical knowledge. Otherwise one of them might have noticed that Newfoundland is not, in fact, a country. Of course the information about glaciers is correct (I hope). One last thought. Just because the book is about one topic, glaciers for instance, doesn’t mean there isn’t valuable information about other topics. 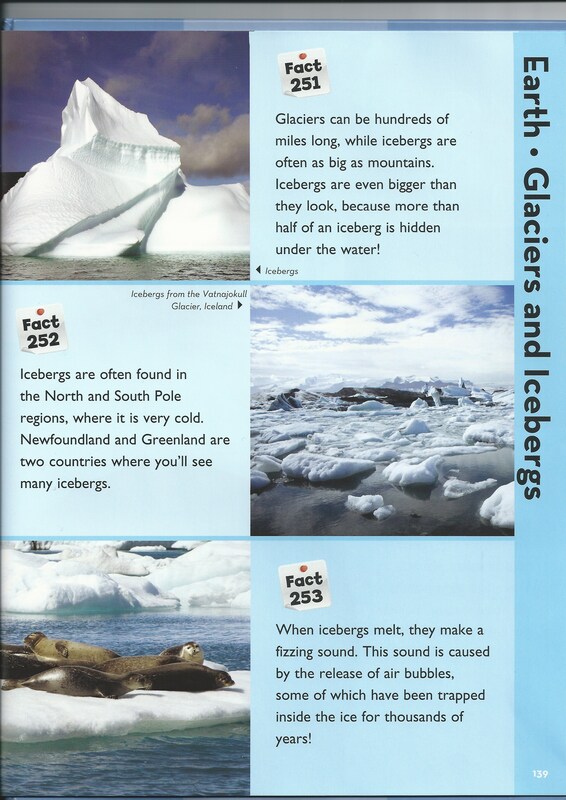 A short paragraph about glaciers also gave information about the geography of our planet. No subject stands alone.